As I write this I am completely and utterly in my happy place: relaxing on my oh-so-comfy sofa in bunny PJs, Sunday night anxiety calmed with a glass of wine, and a stomach so full of sushi that I can hardly move. 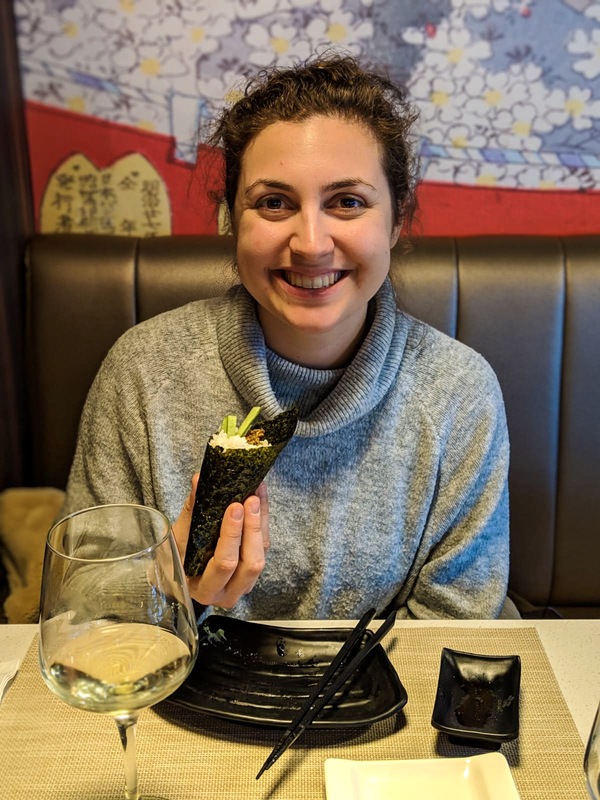 If you know me or have read my ‘hunt for the best sushi in Leeds’ blog post, you’ll know that sushi is my favourite food, especially when I’m hungover. 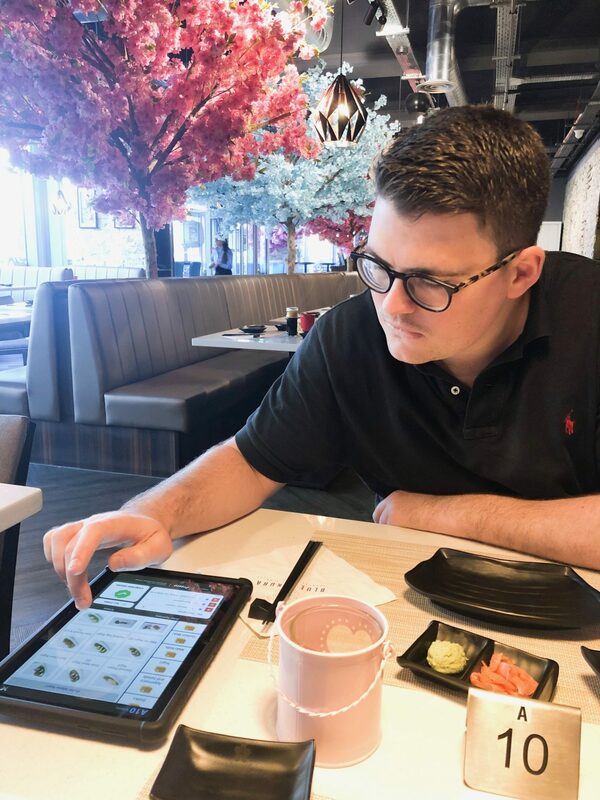 So when I saw that an all-you-can-eat sushi restaurant was opening in Leeds, I literally squealed with excitement and eagerly awaited the next time that a hangover, a sushi craving and a bottomless appetite would grace my presence. Today was that day, following a heavy night celebrating a friend’s engagement. As I headed out into Leeds city centre for some much needed fresh air, I wasn’t particularly on the hunt for food until Billy & I wandered by chance in the direction of the Merrion Centre. As soon as I remembered that we were just around the corner from Blue Sakura, there was no doubt in my mind that a sushi binge was imminent. Minutes later, we were seated at our table and I had a new favourite restaurant. If you love sushi or Japanese food, read on and make sure that Blue Sakura is your next dining destination! 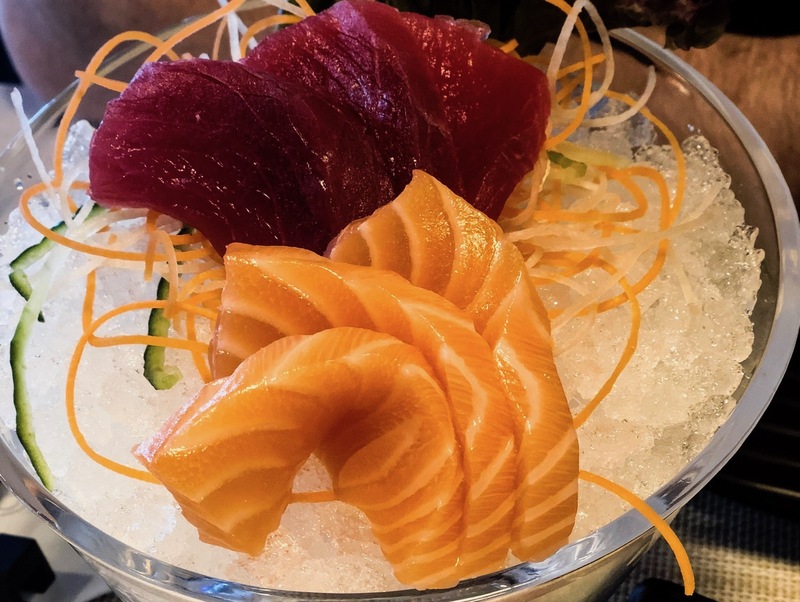 Blue Sakura is an all-you-can-eat restaurant – there is an a la carte option but with all-you-can eat ranging from £18 to £34.99 per person depending on when you go and many of the individual dishes costing £7/£8/£9, you’d be silly not to go for it. Once seated, you’re given an tablet to order your food from. This means there’s no need to worry about constantly bothering the waiter to order more sushi, and no need to feel judged (not that you should ever, ever be judged for eating too much sushi). The tablet is so simple to use, with categories for easy navigation and an overview page so you can remind yourself what you’ve just ordered whilst you wait. You can even order your drinks from here – we had a gorgeous bottle of Romanian white wine that went perfectly with the food! Right, the important bit. Does all-you-can-eat and fancy ordering systems lower the quality of the food? Absolutely not! Sashimi is always the test because there’s nothing to hide behind, so I made sure to try the salmon, tuna, seabass and octopus sashimi all of which was incredibly fresh. We had all the usual – nigiri, maki, hand rolls – plus a few new dishes. Particular favourites were the Black Dragon Roll (very similar to my favourite sushi dish of all time: the Godzilla roll from Candle Bar Edo Sushi, R.I.P), the Spicy Tuna Crispy Roll (cooked tuna which I wouldn’t usually go for but it was delicious) and the Rose Nigiri (Salmon Rose, Tuna Rose and Seabass Rose). If you’re not into sushi, there are plenty of cooked dishes on the menu such as Tempura Prawns, Katsu Chicken, Yakitori and Beef Teriyaki. The hot dishes were good, but next time I’ll skip these and save more room for the sushi! Between the two of us we ate 24 plates of food, but it was so tasty that I probably could have kept going if I’d really wanted to. It sounds strange to say as you order your own food on the tablets, but the service was excellent! We were given the warmest of welcomes before being shown to our table and told how the ordering system worked. My avocado allergy (random, I know) was taken very seriously and the waiter assured me that he was letting the kitchen know that I could order anything from the menu and he would make sure it was all prepared without the green stuff. Every now and again he would come to our table to make sure everything was ok and no avocado was in sight. All the staff were lovely, and when I tried to joke about the amount of food we’d eaten they took great pride in telling us that last week one person had eaten 35 plates by himself! 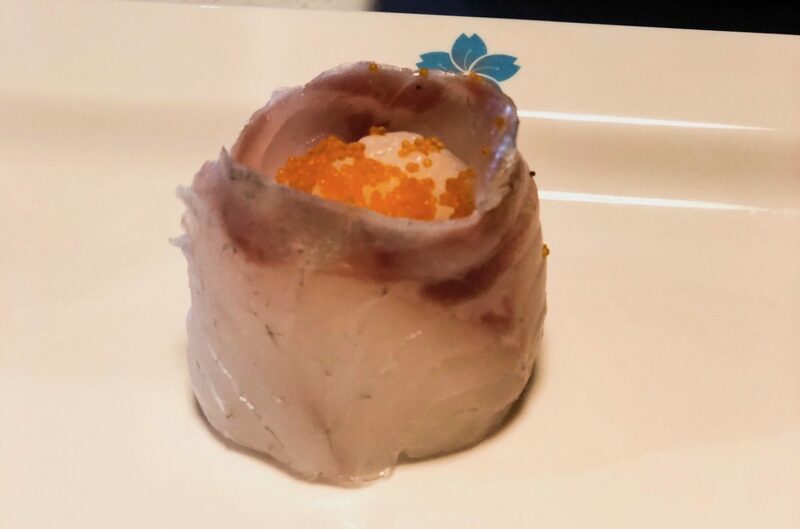 There is nothing bad to say about a restaurant that serves all the delicious, fresh sushi I could possibly eat and perfectly paired wine at a great price. Even the wasabi, soy sauce and pickled ginger was fab! Blue Sakura will absolutely be my go-to hangover (and all the time) restaurant, especially now that Edo Sushi is no longer around.